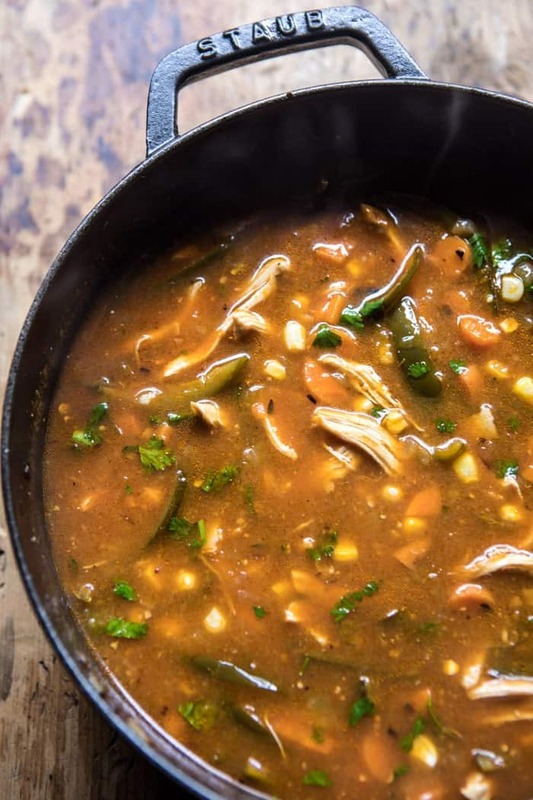 I can see how this poblano corn chicken tortilla soup could easily become a once a week late summer/fall meal. I have been wanting to make this soup all summer long, but felt I needed to wait until the end of August, or early September, when the nights started to get cool and the mornings crisp. For some reason I just really can’t do soup in the summer. To me, soup is a fall thing and I can’t seem to break that mentality. And yes, I know it’s totally not fall…yet, but again this is one of those great transition recipes that’s light enough for summer, but cozy enough to warm us up on a fall day. Can you tell I am way too exited? Anyway, after my brother Kai requested tortilla soup for dinner the other week, I finally decided it was time to make this recipe. I’m not going to lie, I am kicking myself just a little bit for not making it sooner because it’s just SO good. Side Note #1: I did not even know Kai ate tortilla soup (he’s one of the pretty picky eaters in the family), but apparently he had a bowl while in Mexico and loved it. Side Note #2: speaking of Mexico, after spending the end of July and most of August here in Colorado, Kai finally headed back to Puerto Vallarta, Mexico where he was supposed to be living all summer long. If you’ve been following along the last few weeks then you know that my grandma recently passed away. Since Kai was already in the states on one of his little trips back to film with me (he films all the videos you see here), he ended up just staying until my grandma’s service. He finally flew back to Mexico on Tuesday and will now be driving home to LA tomorrow. Fingers crossed his drive goes smoothly…everyone’s a little on edge about it. Okay and done with the side notes. 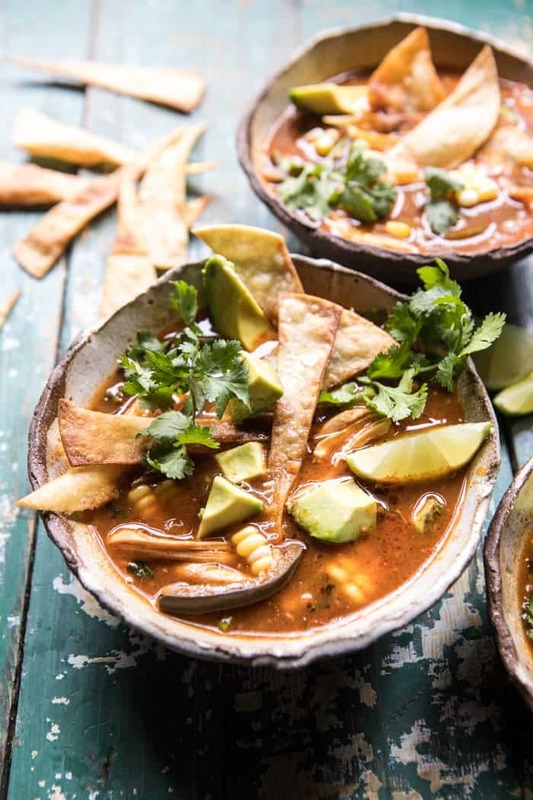 It’s not your traditional tortilla soup, which I think is why I love it so much. I have three not so secret secrets to this recipe. Secret #1: use fresh tomatillos. I know that this looks like a classic red tortilla soup, but I actually used a decent amount of tomatillos for the soup’s base. I am a huge fan of the flavor they add. 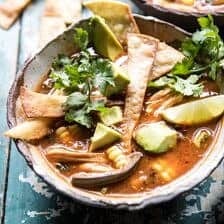 And while you might not be able to pinpoint the taste of the tomatillos upon first bite, they are what make this soup really stand out from all other tortilla soups. Secret #2: enchilada sauce. Whenever I make tortilla soup I also use enchilada sauce instead of canned tomatoes. The amount of flavor the enchilada sauce gives off is unbeatable to anything else. ps. my favorite homemade (and EASY) enchiladas sauce recipe is in my cookbook. Secret #3: poblano peppers. These have got to be one of my favorite peppers. So much flavor. I basically add them to all my Mexican inspired recipes these days. See these stuffed peppers and these enchiladas. 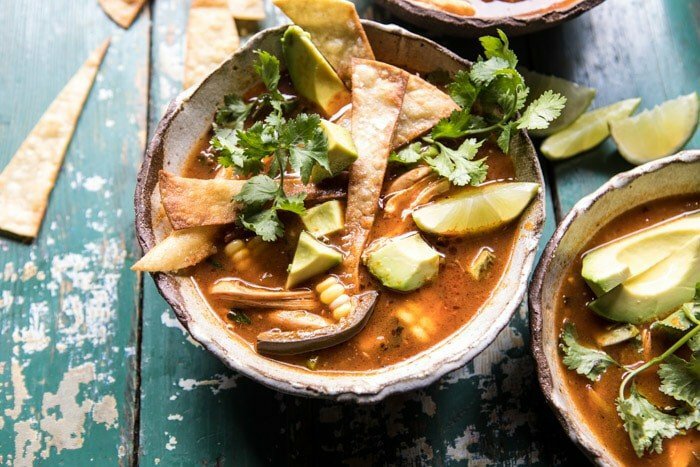 Nothing crazy, but I swear these three ingredients are what make this tortilla soup so special. Okay. Okay. And I also love that everything is made in one pot. Been doing a lot of these recipes lately and I am loving them…hope you guys are too! 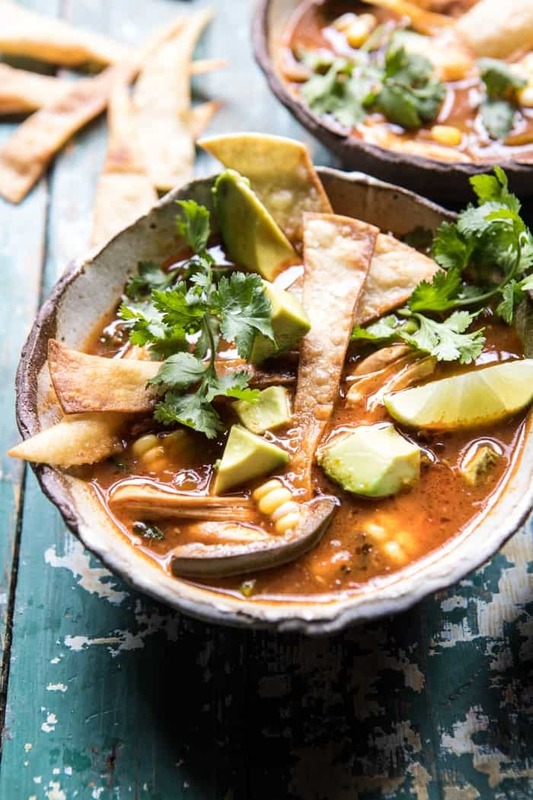 Just like with any tortilla soup recipe, the toppings are very, very, very, important. Meaning, you need lots of tortilla chips (extra salty with a little lime are my favorite), plenty of chopped avocado, good sharp cheddar cheese, and then if you like heat, some fresh jalapeños. Add a margarita and you’ll have Thursday night dinner perfection. Oh and lastly? This is naturally gluten-free and loaded with protein and veggies. So going back for seconds is totally the right thing to do…Healthy-ish Food. This soup is perfect for when you are after a big bowl of comfort! 1. Heat the olive oil in a large pot over medium high heat. When the oil shimmers, add the onion and season with salt and pepper. Cook 5 minutes or until fragrant. Stir in the tomatillos, carrots, and poblano peppers, and continue cooking another 5 minutes or until the tomatillos release their juices and soften. 2. Pour in the enchilada sauce and chicken broth and bring the soup to a boil. Add the chicken and corn, cover and reduce the heat to low. Simmer 20 minutes or until the chicken is cooked through. Shred the chicken with two forks. 3. Remove from the heat and stir in the cilantro. 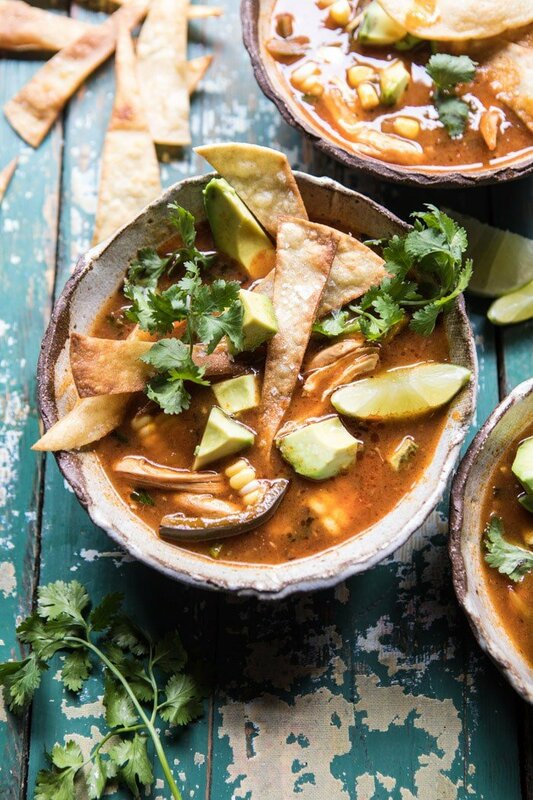 Divide the soup among bowls and top with tortilla chips, avocado, and cheese. Squash a lime over top. EAT! I know, so cozy and delicious, thanks Ruth! I am gathering soup recipes as September, 2017, arrives. Thanks for the recipe. This is a great one, hope you like it Judes! Can you come over to my house and show me how you make these beautiful pictures? Bring some soup. Ha ha, I wish I could Ben, I’m sure we would have fun. I am thinking of doing some photography workshops in the future, so keep posted! Soup:) soup…. Love it! look so amazing! Thanks so much, Rebecca! Have a great weekend! It feels like fall here too, the rain has started to pour and it is just screaming for soup! I’ll try this one but not sure I can find tomatillos here in France though. Sounds like the perfect cozy soup weather! Thank you! Quick ? Do you cube the chicken at all or just leave a couple large pieces? Hey Anne, I like to shred the chicken. Hope you love the soup! I just leave it in pieces and then shred it after cooking. Enjoy! soooo good – and makes so much!! 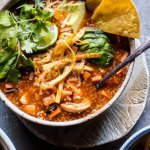 I love chicken tortilla soup and a non-traditional version sounds just perfect to me. Can’t wait to make this as soon as the weather cools off a bit! Oh my! Made this tonight…it is soooo good! Make it, you won’t be disappointed! Your tortilla chips look so much better than the bagged kind. Are you using fried flour tortillas? Nope, just corn tortillas fried in a little olive oil. Thank you! Hey Tieghan, Been on staycation this week and have spent a great deal of time in the kitchen (where I don’t get to as often as I’d like). I put your yummo soup together late last night and we enjoyed it this evening. My only idea was to put in black beans for extra fiber and well because who does not love them?! This was 1 of your 3 recipes I’ve made this week, yay! So much fun…I have been canning tomato’s and canned lovely of chipolte salsa today with all veggies from our garden…such a good feeling putting up bounty for the winter. I made this tonight and it was soooo good. My store didn’t have poblano peppers, so I subbed with anaheim and it was still fantastic. Definitely making it over and over this fall/winter! This was amazing! It takes even less time if you use a rotisserie chicken instead of a raw one. It took longer to chop the veggies than to cook the soup and the flavor is wonderful. Tasted like it had been simmering for hours. Made this tonight for dinner – so good! A new favorite. Thank you for sharing. thank you! thrilled you love the recipe! I’m making this tonight but am I clueless… do you just put the whole tomatillo in the pot and it cooks down or do I take it out after it releases the juice? Also will I just have big slices of poblano in the soup or do I take those out after cooking too?! Hi Brooke, you want to dice the tomatillo and then it will blend into the sauce. And leave the poblano in the soup, if you prefer you can dice the sliced so that they are not so big. Let me know if you have other questions. Hope you love the soup! Bought the stuff last night…making for dinner tonight! can’t wait!!! I hope you love this Karen!! How would I modify this to make it in a slow cooker? Love your recipes! Saw you on Home and Family and bought your cookbook for myself and both my daughters! We all love it! Your Chicken Enchilada’s with pineapple are the best! My grandson who dosen’t like enchilada’s loved them, definitely a winner recipe! 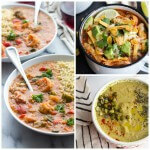 Question………..the soup calls for Poblano Chilies, having trouble finding them. 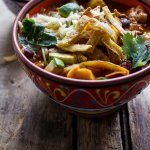 Can I use Pasilla Chilies in place of Poblano? Can’t wait to make this soup! Could I freeze the left overs? The recipe says tomatillos with “skin removed”. Does that mean husks removed or do you actually peel the skin off of the tomatillos? The recipe looks amazing! Thanks. I made this soup last week and it was a big hit! I looked up homemade enchilada sauce recipes before making this, and couldn’t believe how easy it was to make, and I think it really made the soup extra special. Thanks for the tip, I would never had thought to do that on my own! I am so glad you loved this soup and my photo! This is so sweet! Thank you Genevieve! This is my favorite soup recipe in the entire world I think I make it once a week! That is so amazing! Thank you Christina! I served this to a group of real “foodies” and they LOVED it! Asked for the recipe! Deliciousness!! Yum! I also added the black beans, and at the last minute decided to throw it all in the instant pot. Soup setting for 30 minutes worked perfectly. We seriously loved this and its so easy. Thank you!! I am so glad you enjoyed this Ginger! I’ve made this soup more than a few times. Thank you for putting it out there, it’s delicious and always anticipated.